Kaitlyn Weaver and Andrew Poje perform their Short Dance at the 2016 Canadian National Figure Skating Championships. 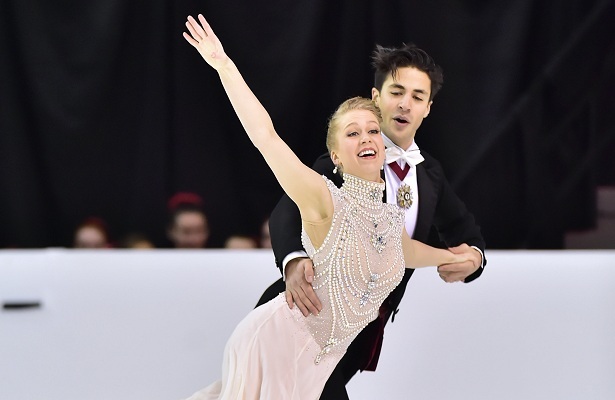 Kaitlyn Weaver and Andrew Poje showed in their waltz short dance set to Blue Danube that their undefeated streak this season is likely to continue at this week’s 2016 Canadian National Figure Skating Championships, just as it did last season up until this same point in time. With three level four elements and impressive program components scores, including no less than “2s and 3s” across the board for grades of execution (GOE), the Detroit duo scored 76.20 points. The performance at the Scotia Centre marked their first competitive return to Halifax since they debuted here in 2007. At that time, they were a surprising third. Today, it would be a greater surprise if they were first without a significant lead. Playful and animated in bright fuchsia and turquoise costumes, Piper Gilles and Paul Poirier skated their Beatles routine with a renewed energy given the additional training time that provided their exclusion from the Grand Prix Final in December. The duo, who train in Scarborough, Ont., scored 70.63 points. “We have been working so much the last two months on just ironing out some kinks that were kind of part of the program that were getting sticky and ruining the momentum from building throughout the program,” explained Poirier. The changes included a modified final pose, however the V-sign finger peace symbols remained. Known for their unique choreography and style, they continue to find their groove in the unexpected. Elated with their balletic short dance score of 68.30 following a clean performance that has eluded them thus far this season, Alexandra Paul and Mitch Islam agreed that “relief” best characterized their feelings post skate. The charming short dance which revolved around a concept of Islam coveting his ballerina, included four level 4 elements, more than the other top-three teams. “It’s really amazing to be able to show everyone what we’re capable of and we’re just really excited to have finally been able to do that today,” added Paul. The skate signalled their interest in galvanizing their position on the Canadian ice dance scene. “The depth in ice dance is credible so we’re looking to establish ourselves as a top team,” said Islam. Élisabeth Paradis and François-Xavier Ouellette of Quebec were fourth (63.03) and Nicole Orford and Asher Hill were fifth (61.46).